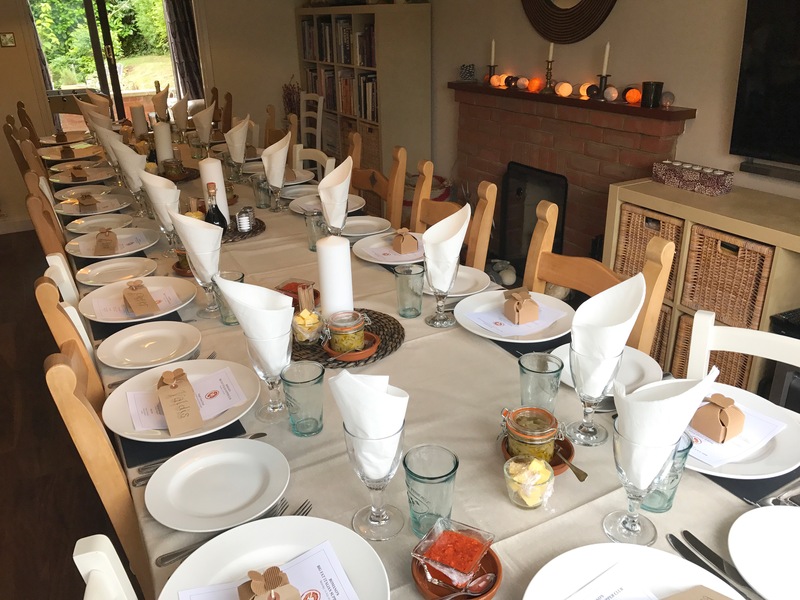 When talented cook and baker Paola Davies-Romano thought about hosting a supper club, I jumped at the chance to help make it happen. 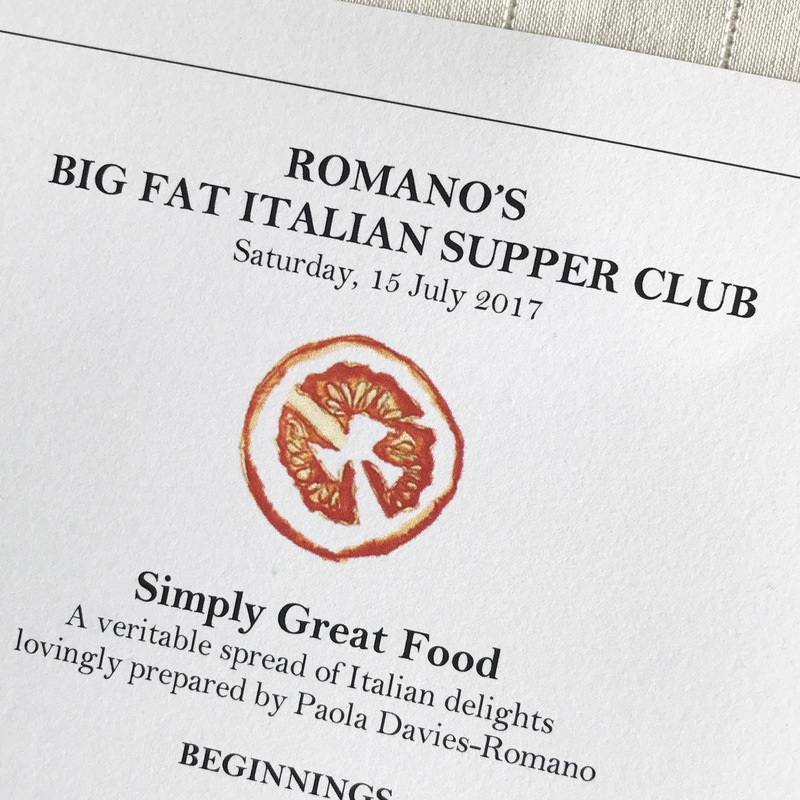 I coordinated the promotion, bookings and payments whilst Romano’s website was under development… but the culinary brilliance was all Paola. My only involvement with the food was eating it! Born in Essex to an Italian father and Spanish mother, Paola lived in Italy during her childhood and teenage years. 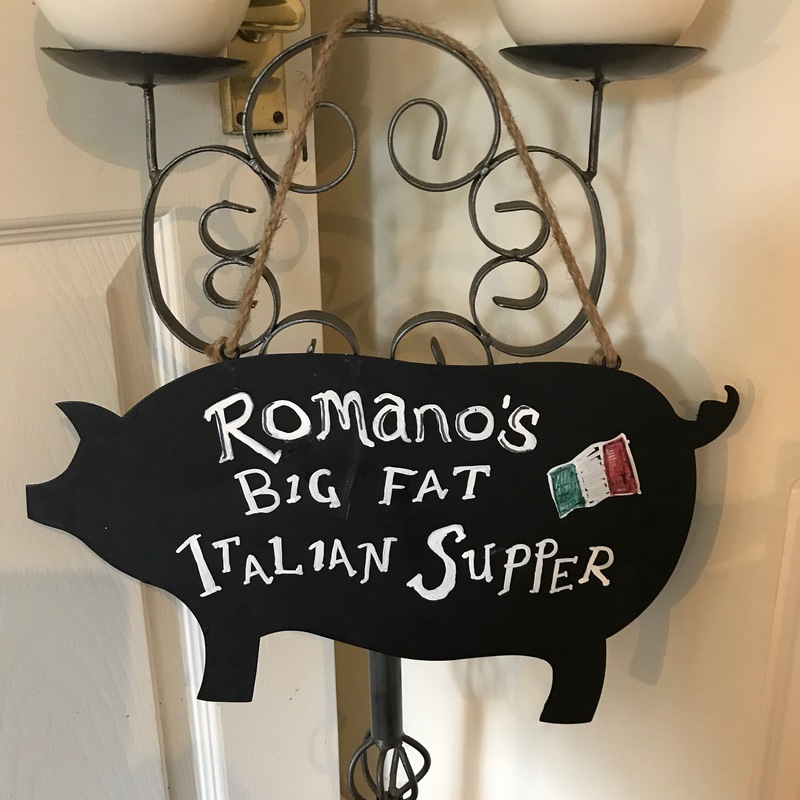 It was only fitting for her very first supper club to have this theme so it was named Romano’s Big Fat Italian Supper Club. 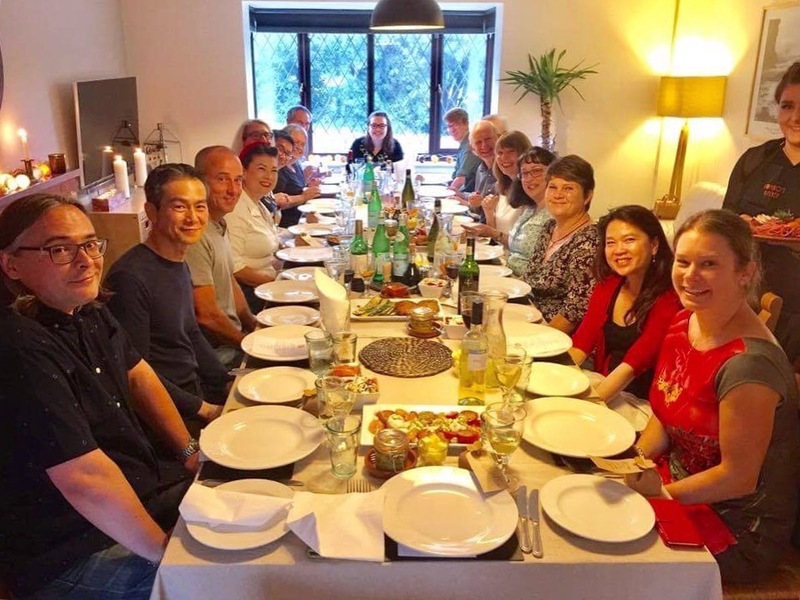 In true Paola style, Romano’s went BIG with lots of food, flavours and fun… all celebrated around an inviting communal table in her home. Paola even put together a set list of Italian music which added to the festive ambience. 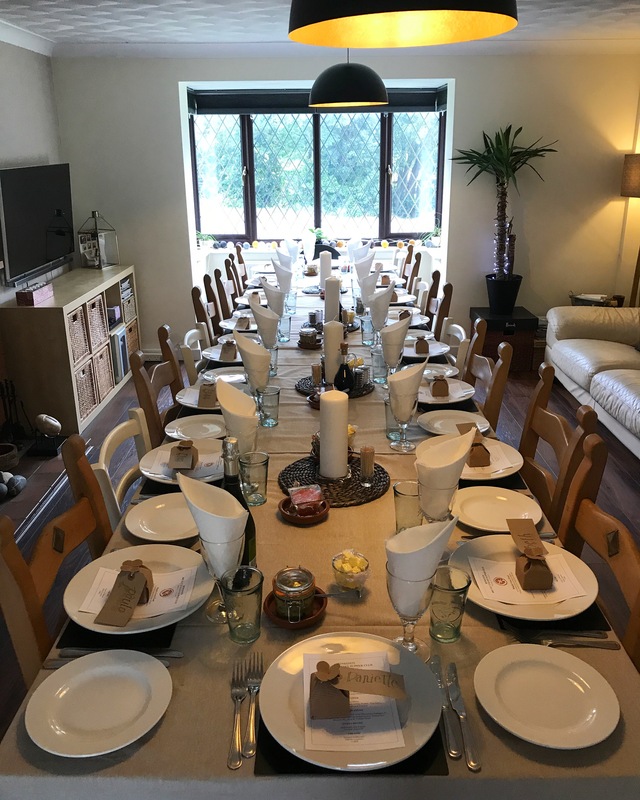 Places for the supper club were extremely limited and they filled up very quickly. It was great to see that there are adventurous foodies out there who are up for this kind of experience. 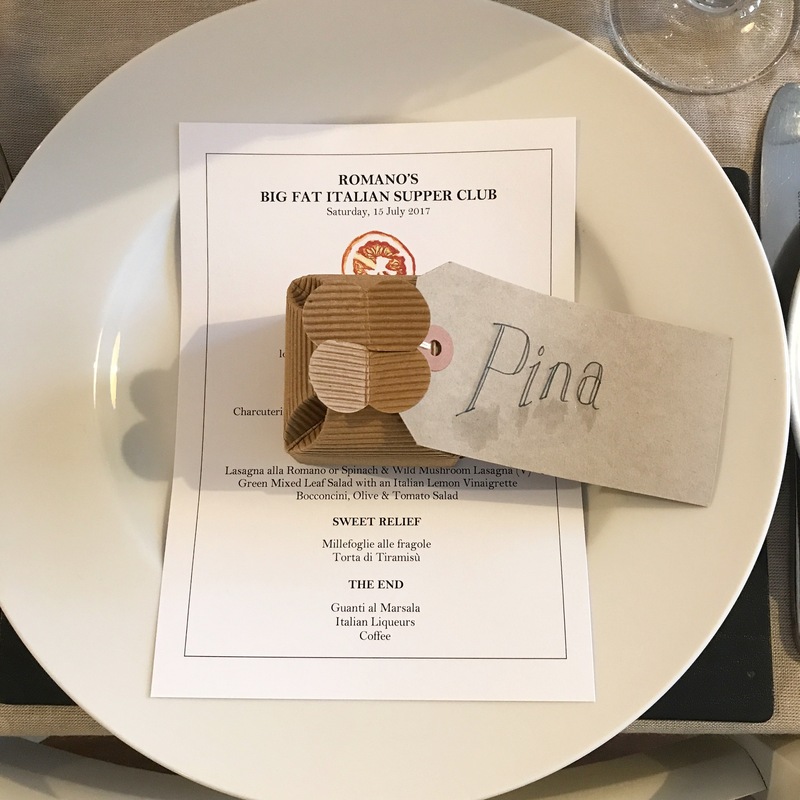 The exact location was only revealed a week before the event and the menu was kept a surprise until it was placed at the beautifully set table. Paola drew inspiration from her roots in Italy’s Campania region which includes Naples, a city with one of the most renowned cuisines. 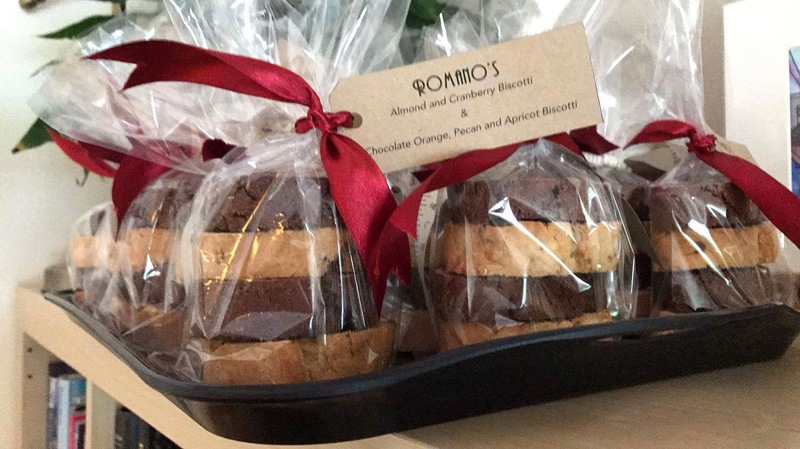 Romano’s feast of Italian delights featured a three-course meal and some additional treats. The event was BYOB but bottles of still and sparkling water were provided. 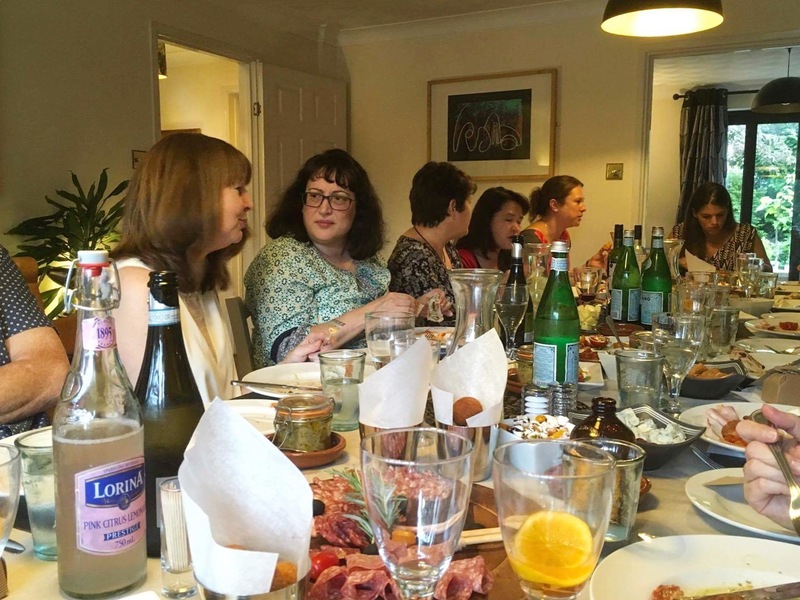 The guests enjoyed an Aperol Spritz whilst they mingled and introduced themselves before being seated. Paola popped out of her busy kitchen to welcome the guests then the Romano’s team (Jerry, Arianne and Joe) sprang into action. Paola made regular appearances to announce and describe the dishes in each course, giving us some insight into the regions in Italy. 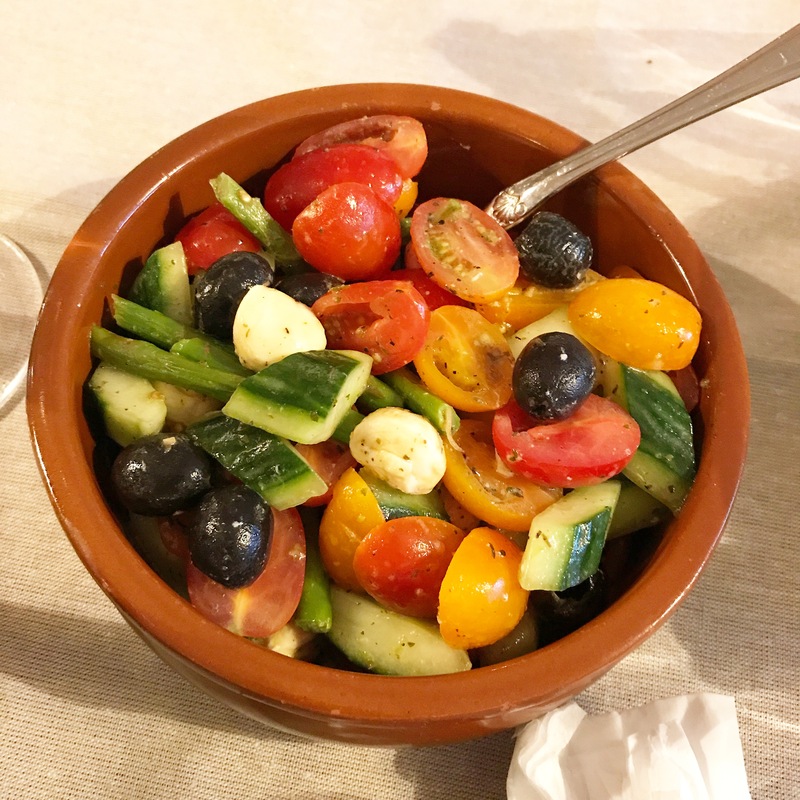 The first course, titled Beginnings, featured Antipasto Misto (antipasto means “before the meal”) with all of the requisite elements: charcuterie, cheeses, olives, tomatoes, bread and marinated vegetables. 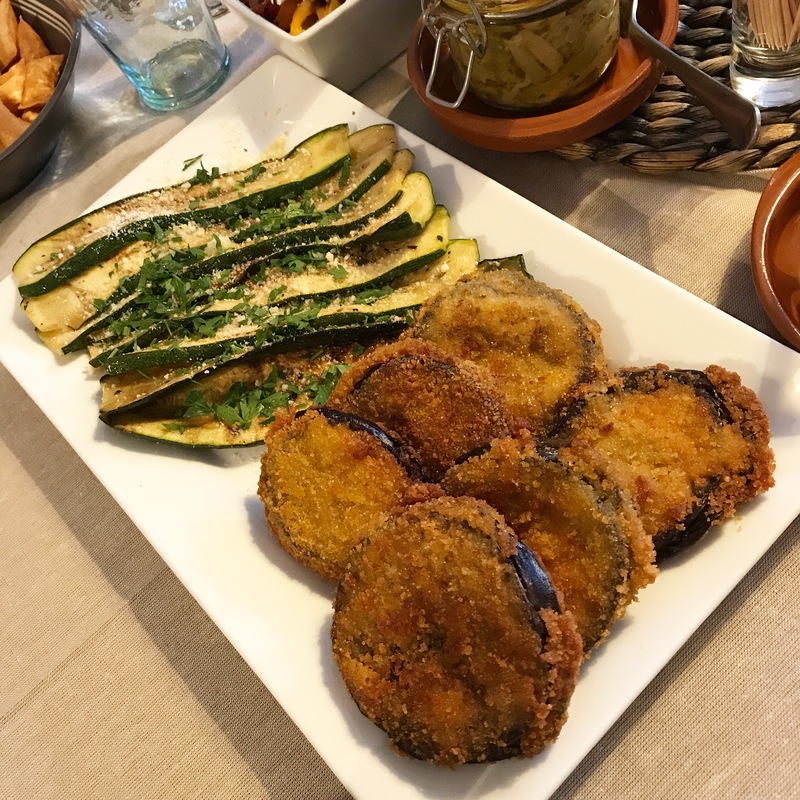 Paola made the pickled aubergines, which were a big hit. The peppers in agrodolce (sweet & sour sauce), topped with crumbled goats cheese were particularly good. The charcuterie was presented the traditional way with the cold meats folded into a flower-like pattern on the platter. 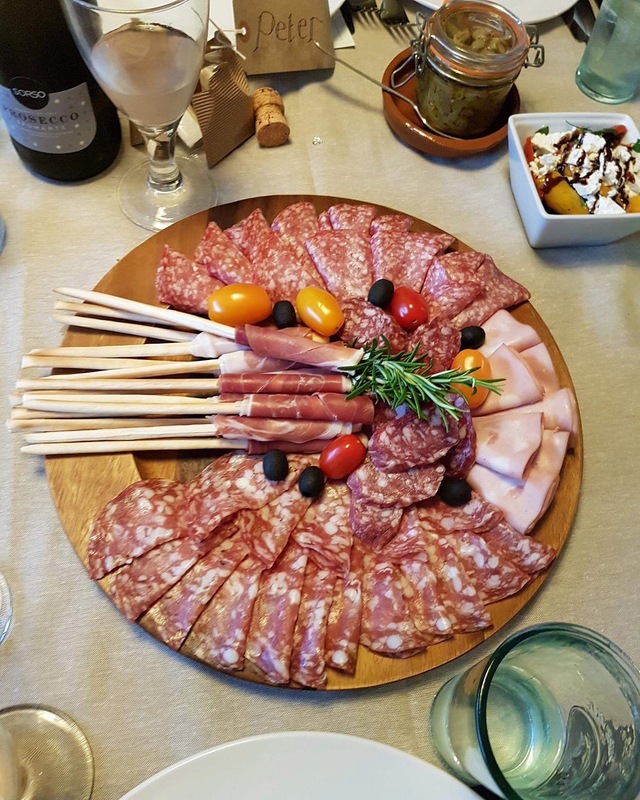 There was prosciutto di Parma wrapped around torinesi (thin breadsticks), mortadella, salami and strolghino di culatello (a lean, delicate sausage from the hind muscle of a pig’s thigh). It was thickly sliced and Paola explained that the Italian way to eat it was to peel the skin first. Oh but there was so much more! 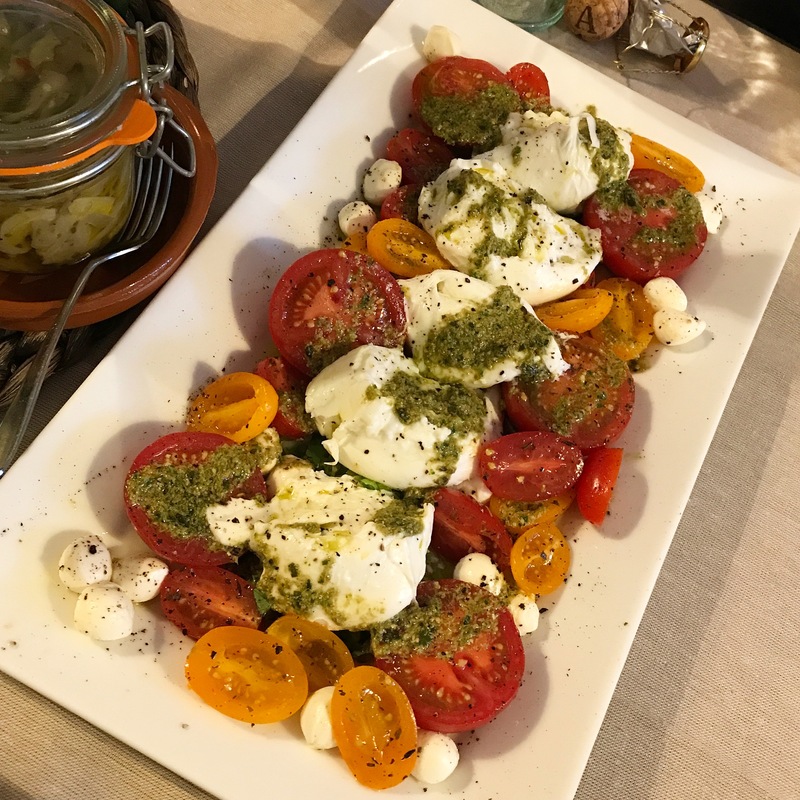 Tomatoes and mozzarella di bufala with a pesto drizzle provided a burst of fresh flavours and creamy goodness. 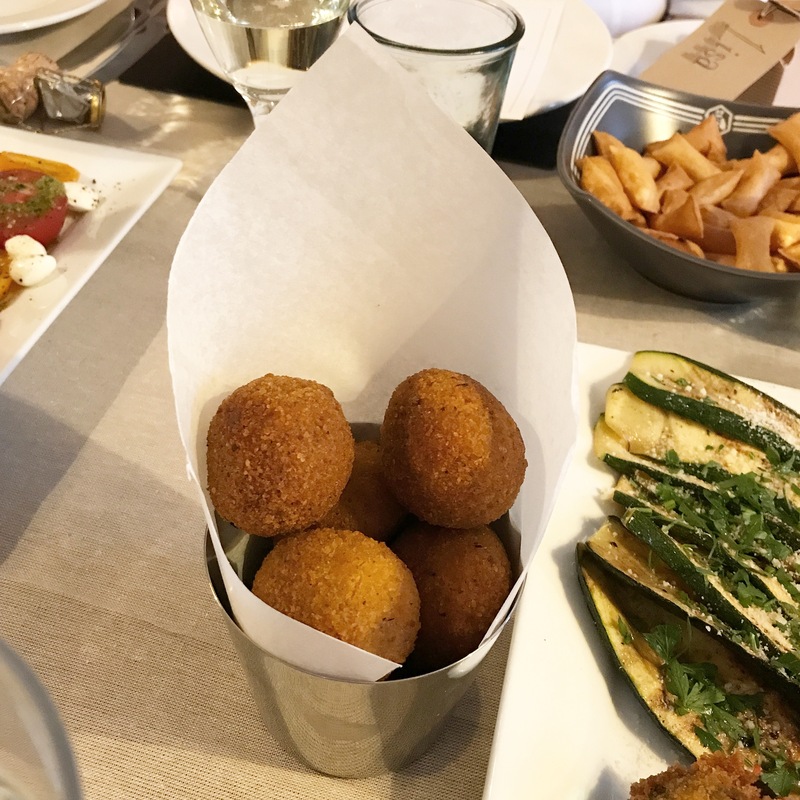 The arancini (little rice balls) were moreish. I could have eaten a whole bucket load if they weren’t so filling! 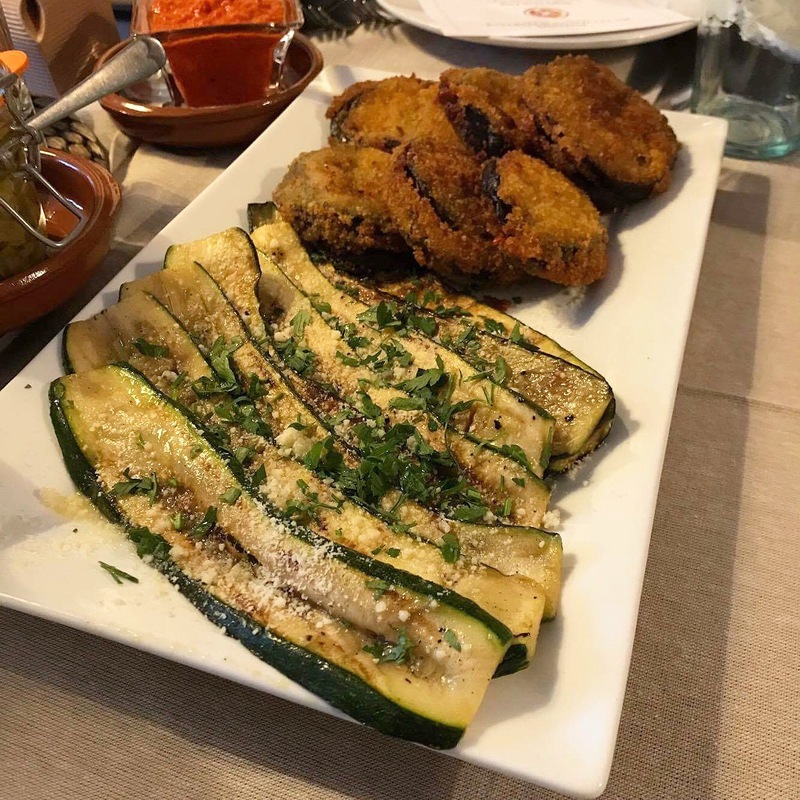 As if all that wasn’t enough “before the meal”, we were treated to chargrilled courgettes with fresh parsley, Parmesan and garlic infused oil as well as Melanzane in Carrozza. These delightful chargrilled aubergines, sandwiched with mozzarella and red pepper pesto, were breaded and shallow-fried. Everything was so good I had second helpings until I realised that I still needed to make room for another two courses. Here’s my “am-I-gonna-have-room-for-that-lasagna” face! 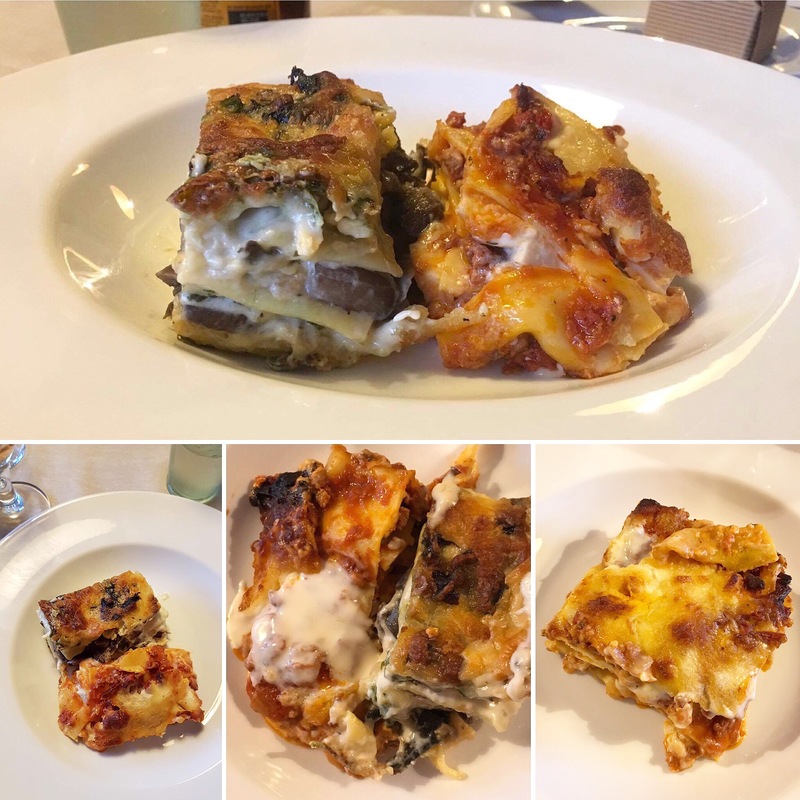 The Main Event featured lasagna, notably Paola’s famous Lasagna alla Romano (possibly my favourite dish of all time). It was filled with layers of meat, cheese and succulent tomato sauce but also included sliced hard boiled egg and chorizo, Paola’s special touch. The meatless Spinach & Wild Mushroom Lasagna was delicious too. 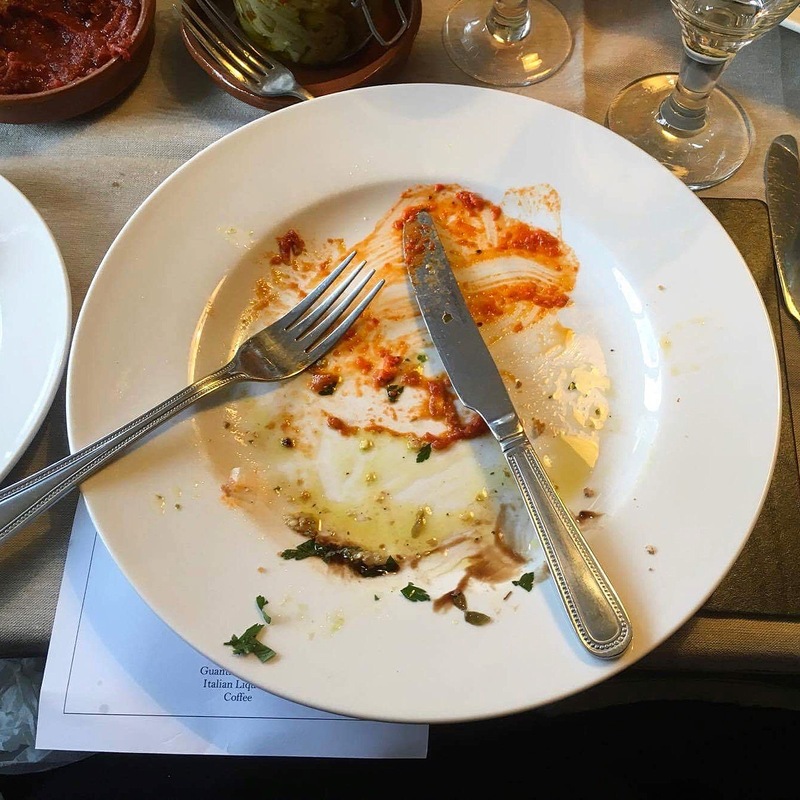 As there was only one person in the group to request the vegetarian option Paola gave everyone the choice to have a bit of both lasagnas, which was happily accepted. Well, except me who wanted ALL of my very favourite lasagna but I did have a taste. 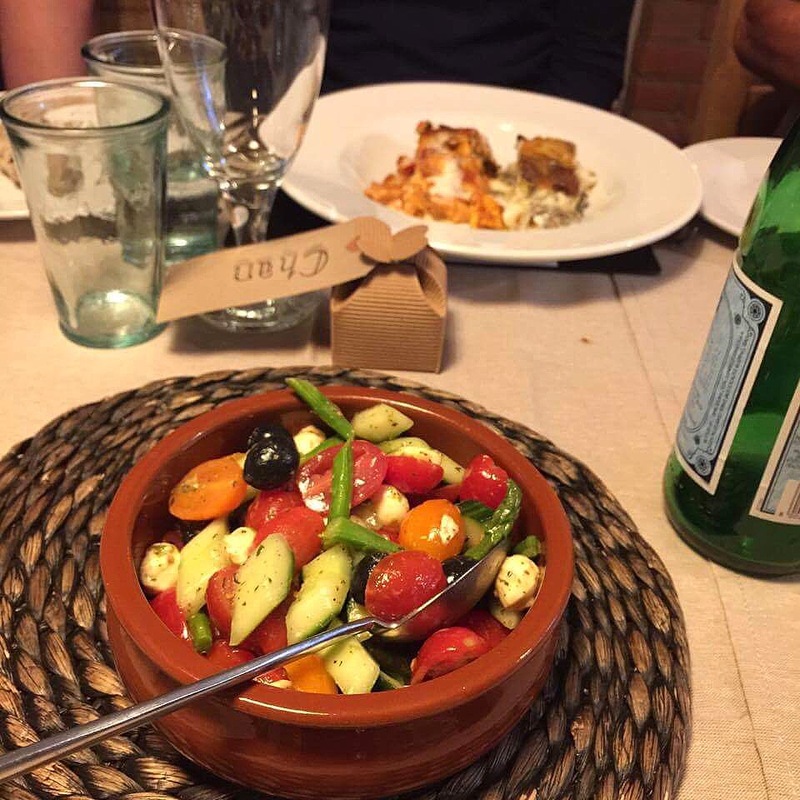 Accompaniments to the lasagna included a green mixed leaf salad with an Italian lemon vinaigrette and a bocconcini, olive, asparagus, cucumber & tomato salad. We took a little breather between the main course and desserts and sang a few bars of Shaddap You Face and That’s Amore. I had the idea of printing the lyrics to those songs behind the menu, so there was no excuse not to join in! As you can see in the videos, everyone enjoyed that little bit of camaraderie. The third course, titled Sweet Relief, featured not one but TWO desserts! 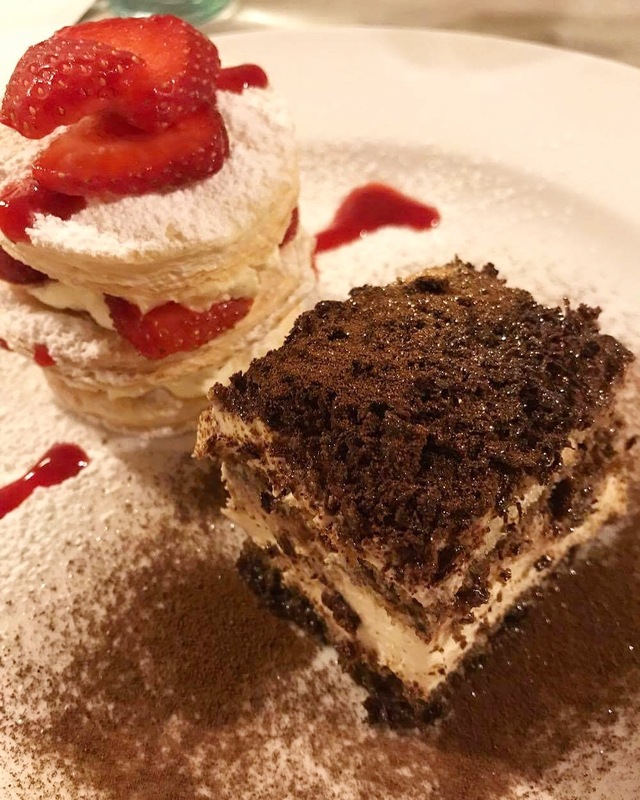 The Millefoglie alle Fragole (strawberry millefeuille) consisted of airy, flaky pastry “leaves” layered with rich cream and fresh strawberries, drizzled with a tasty coulis. 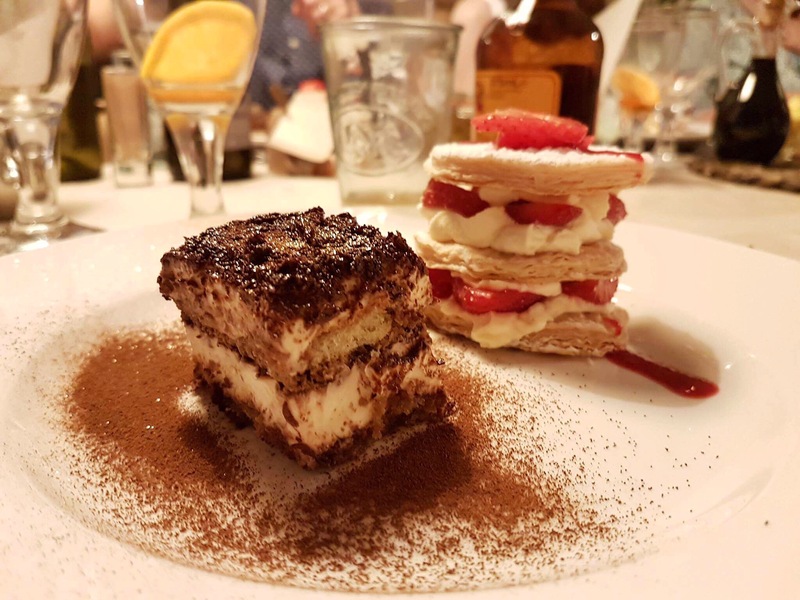 The Torta di Tiramisù was phenomenal. I usually don’t eat this dessert as I’m not a big fan of the taste of coffee but I gobbled this all up. The layers of light sponge, decadent chocolate and creamy mascarpone cheese were a match made in heaven. As an additional treat to go with our coffee or tea at the end of the meal, we were served Guanti al Marsala. 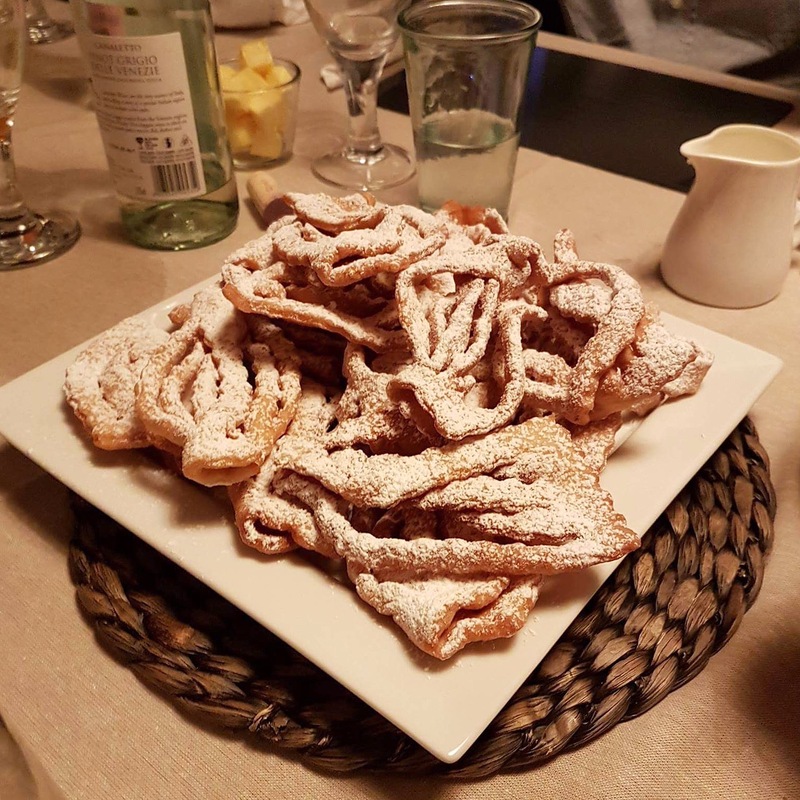 Guanti means “gloves” as these fried pastry strips sort of resemble hands. 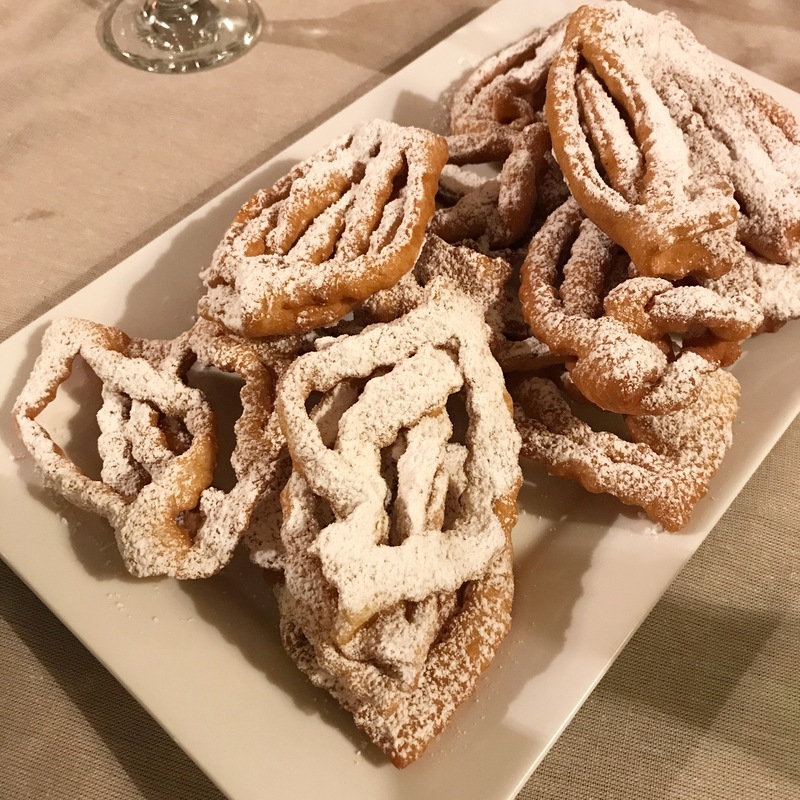 The guanti were flavoured with marsala (a fortified wine from Sicily) and dusted with icing sugar just before serving. 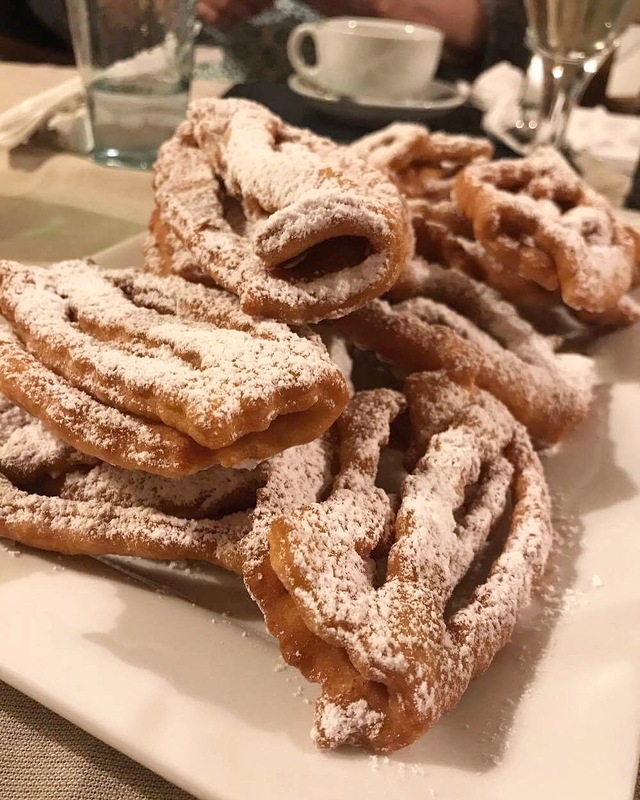 There are countless variations in shapes and names throughout Italy of this popular treat usually served on special occasions. I know them as chiacchiere as my Italian roots are from Lazio and Molise. 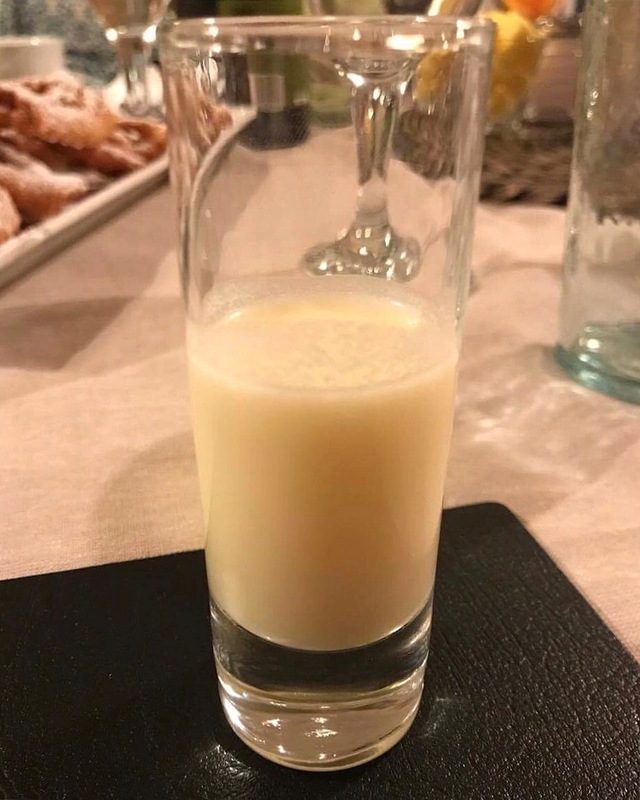 Paola went the extra mile and made her own Crema di Limoncello, a creamy liqueur made with lemons and vodka. It was smooth and sweet on its own but would be great drizzled over cake or even ice cream. So addictive! 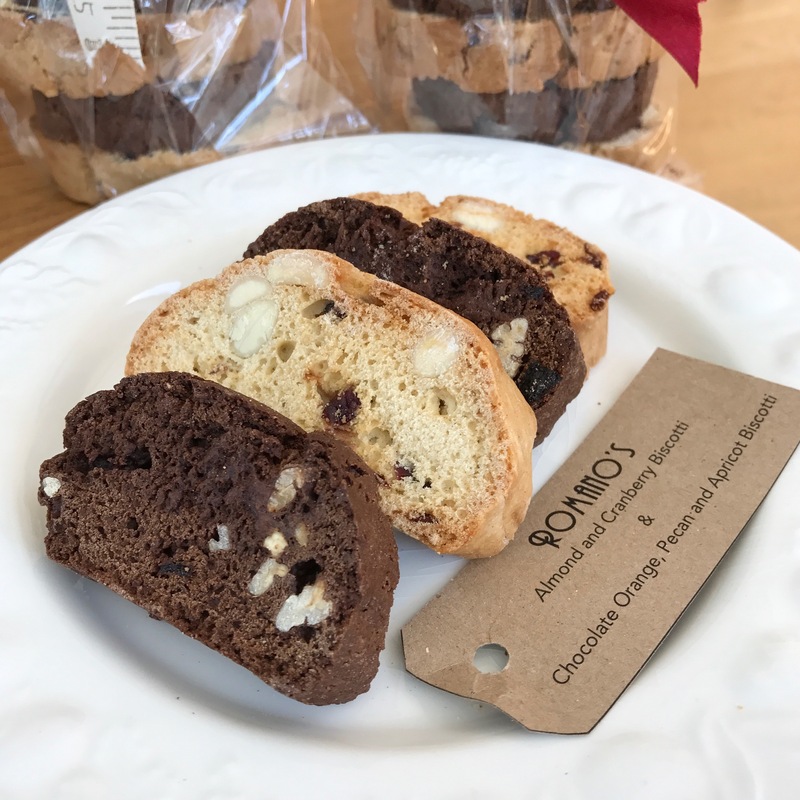 The little box with our names for the place settings contained some treats but we were also given a bag of Paola’s homemade biscotti: almond & cranberry and chocolate, orange, pecan & apricot, which were both scrumptious. 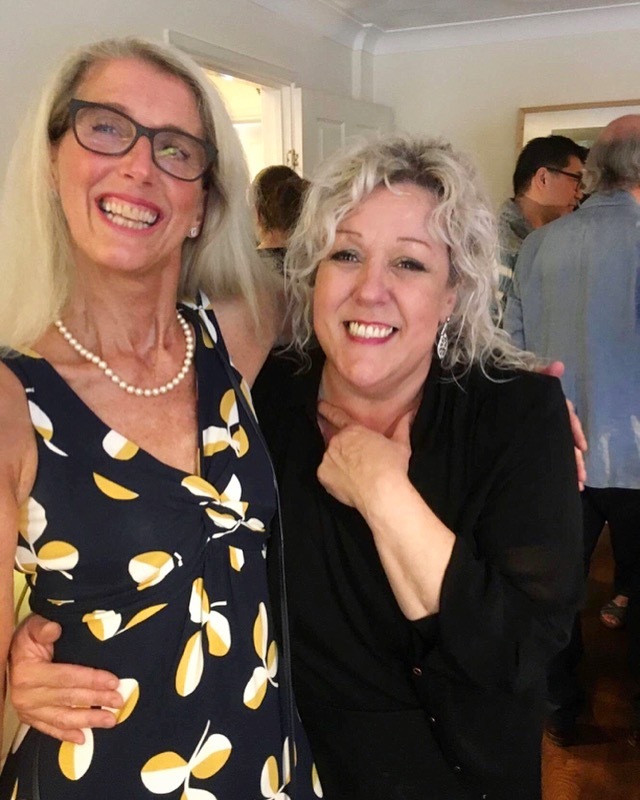 It was a wonderful evening filled with joy, music, laughter and plenty of delicious fare. 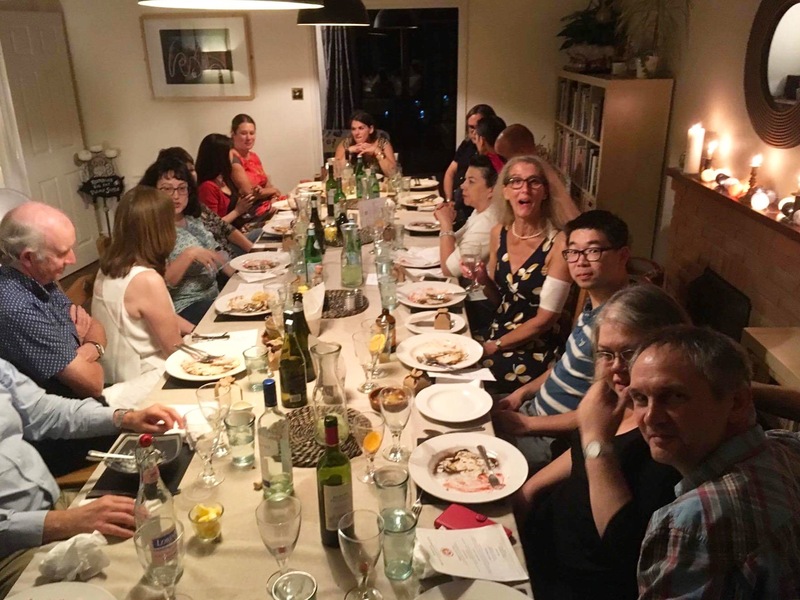 Food has a great way of bringing people together and we all made some new friends. 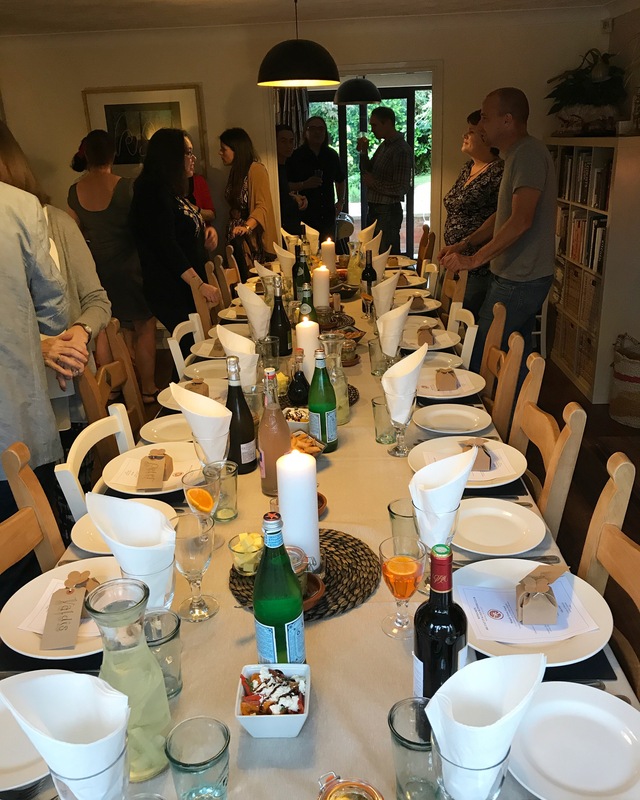 Supper clubs, especially when they are held in the home, are a reflection of the host and cook and Paola made us feel like valued guests she enjoyed feeding. It was a pleasure to see this talented lady in her element, expressing her passion for cooking and hospitality. She was positively beaming! 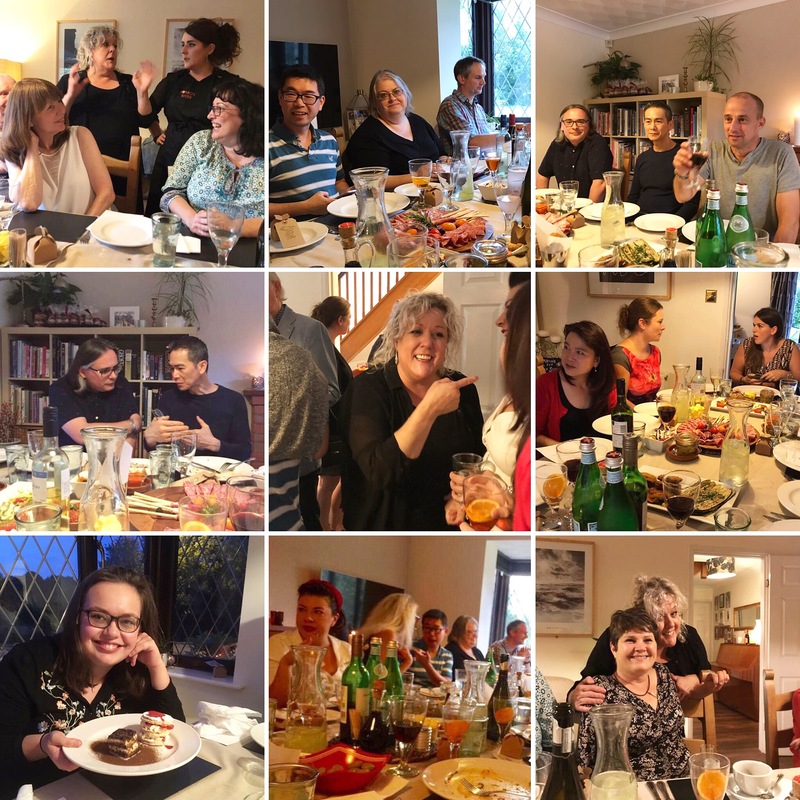 To see what Paola is cooking up next, keep an eye on Romano’s website and social media for upcoming supper clubs, pop ups or cookery courses. Then make sure you snap up your place! Although I helped organise the event, all views are my own. It is based on my experience at my own cost and I did not receive compensation for my review. 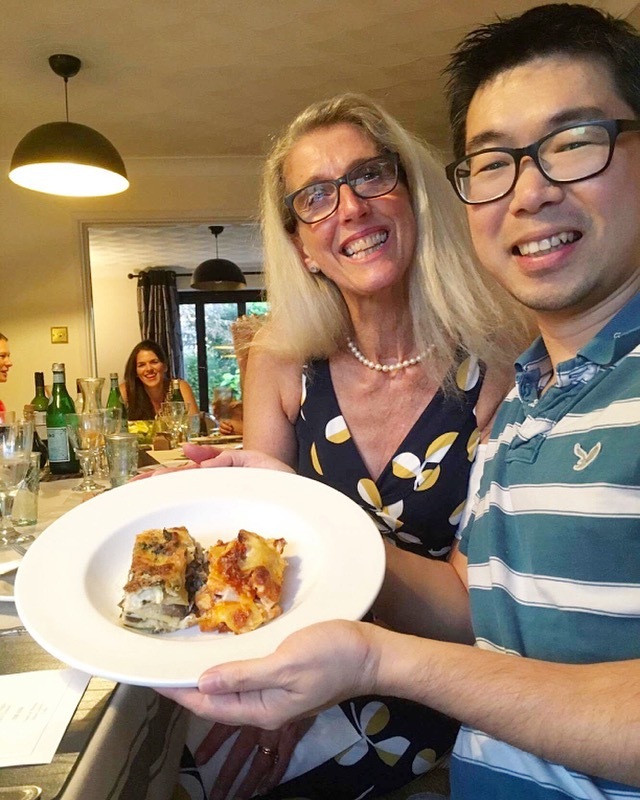 This entry was posted in Food Events and tagged antipast misto, arancini, biscotti, Cambridgeshire, cream di limoncello, guanti al marsala, lasagna alla Romano, melanzane in carrozza, millefoglie, Paola Davies-Romano, Romano's, Romano's Big Fat Italian Supper Club, strolghino di culatello, supper club, tiramisu, torinesi by One Two Culinary Stew. Bookmark the permalink. It sounds amazing… so much wonderful food and I can sense the atmosphere from your description. So sad to have missed it! It would have been lovely to have you there!